Sooo... I know I've been MIA again lately and I'm sorry. 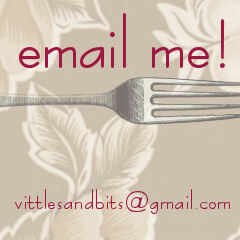 Mr. Vittles and I have been super busy. I just feel like there are not enough hours in the day! Bad news out of the way first - my grandmother has unfortunately been ill this week, so I've spent a most of my evenings with her and my aunt at the hospital. Unfortunately they don't know what is causing her issues yet, but she's been a trooper! Hopefully we will get a resolution to that soon, and she'll be feeling better. On a lighter note, I finally got my act together and started checking out baby stuff for my registry. I have been talking to moms & soon-to-be-moms, poring over websites, reading reviews, and adding & deleting items for hours on end. And I'm still... not... done. Soooo different from doing my wedding registry! That was incredibly easy. Mr. V and I had lived together for a while and acquired a lot of stuff, so I was mostly concerned with one thing - what do I want? This is totally different. Now I need to think about what I need, what's good, and what's safe. Aside from that, we also went away for a long weekend to my mother & father in-laws' vacation home on the St. Lawrence River in Canada. Their place is in the Thousand Islands, and you can only get to it by boat. They already had a full house of 8 guests (5 adults & 3 kids), but still welcomed us and two of our friends! The house (while adorable) is not overly big, but it sleeps a lot of people - so it worked out great. Never a boring moment, AND we all got a bed - best of both worlds! I wish I had pictures, but you'll have to take my word for it - the area is just so beautiful and relaxing. And we had so much fun! I was really reveling in the cool air, outside shower, fun conversation, and delicious foods. One night we sat around a fire and made s'mores. Well, actually the kids made s'mores, and the adults just mostly ate toasted marshmallows. Because as delicious as s'mores may be, they are also very messy. Enter gooey s'mores bars. 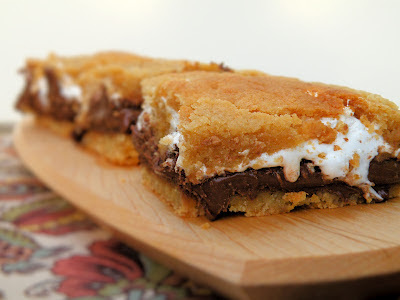 These are actually a little messy too, but not nearly as bad as a real s'more. Plus you don't need a fire, which is pretty convenient if you're not camping or at your in-laws' awesome river house. I'll be honest though - Mr. Vittles didn't seem to be a fan of these bars. He didn't say they were bad or anything, he just wasn't overly impressed. I did also get really worried at one point that I didn't have enough of the graham cracker dough left for the top, to hold the insides together. But once it was all baked & cooled it was totally fine. So if this happens to you too, have no fear. I thought these were great, and I give the original recipe two thumbs up! ...and they were gone by noon. Now mind you, I get into work a half hour earlier than most people in my office and I just left the plate in the kitchen without saying a word to anyone. So people didn't even know what they were or where they came from - and they still ate them all. Although... not sure if that says a lot for the bars, or just not much for my coworkers? Preheat oven to 350°F. Grease an 8-inch square baking pan with nonstick spray. In a large bowl, beat butter & brown sugar until light & fluffy. Add egg and vanilla, and beat until combined. In a small bowl, whisk together flour, graham cracker crumbs, baking powder and salt. Add dry ingredients to butter mixture and mix at a low speed until dough forms. Press half of dough into an even layer on the bottom of the prepared pan. Place chocolate bars over dough - cut or break the chocolate (if necessary) to get it to fit in a single layer. Then, using the back of a spatula sprayed with non-stick spray, spread marshmallow creme over chocolate bars. Place remaining dough in a single layer on top of the fluff (*see note below). Bake for 30 to 35 minutes, until lightly browned. Cool completely before cutting into bars. Makes 16 bars. *Note: Easiest way to do this is to flatten pieces of the dough and shape into small rectangles, then lay them on top of marshmallow layer. Pinch the dough pieces together to make a solid top piece). Those bars are awesome. Thanks for sharing. Hope your Grandma feels better! Smores bars have been hit or miss in my house. Either the man demands to know where I've hidden them or won't touch them. Can't win. I don't have children, but I can understand how overwhelming picking things out must be. When the BFF had her first and I was picking things as simple as bottles out for her I almost left the store screaming pulling my hair out. Ahhhhh! your link to print this recipe is broken! Please fix it so that i can make these asap! Hi Jean, it's working for me so I'm not sure what's going wrong on your end. What I'd suggest is copying & pasting the part you want to print into a blank document in Microsoft Word (or your computer's equivalent) and printing from there. Sorry! I know what you mean about being overwhelmed by baby stuff. I have to highly recommend Thirsty cloth diapers. They are WONDERFUL!!! They are just as easy to use as disposable, and they NEVER EVER leak. They take a little getting used to, and it's a little confusing figuring out what you should buy from their website. We originally thought we would use disposable when we went out to make things easier, but it wasn't any easier so now we never do that. I had thought the cloth diapers would add to the laundry, but it really doesn't since we have to do a load of baby stuff every 2 days so we just wash the diapers in that load. If you have any questions about them please feel free to ask.